Brandi Nell the Southern Belle: New Stairs! YAY! Hi friends! I hope everyone is having a good week! The weather has been FABULOUS here in Atlanta the last two weeks. It makes me so excited for Spring and Summer! 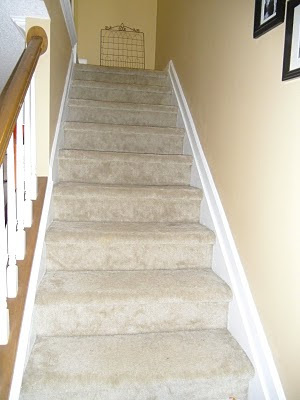 I am so excited to tell you guys that we finally got the stairs finished. Remember me telling you about them a little while ago? We stripped the carpet down to the padding. Then we had to pull up all of the carpet nail strips (I HATE THOSE THINGS) and pull out all of the staples. This took us three afternoons to complete. NOT a fun process! 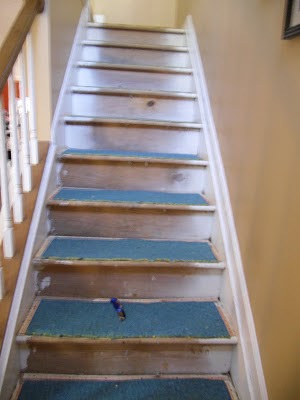 Once all of the nails and staples were removed, we had to sand and clean the wooden treads as well as fill in any cracks or holes that were visible. Finally we were able to stain the treads and paint the risers. Once the stain and paint had time to set, we applied two coats of polyurethane. And finally, we have our finished project! Hooray! 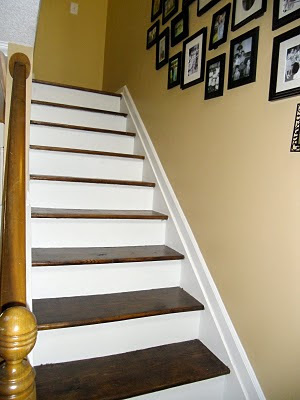 And yes, I am very aware of the color difference between the stairs and the Bannister. We are planning to change that out eventually! I am so happy to not have carpeted stairs anymore! This wasn't an extremely expensive process, but it definitely was extremely time consuming. I definitely think it was worth the hard work though - it looks so much better! 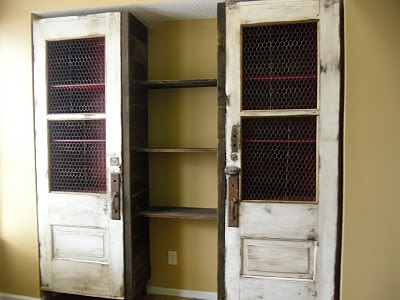 Also, as promised a couple of weeks back - here are some better pictures of the Antique Doors turned cabinets in my office. I still have to buy some items to put in them and on the shelves! HA! I have a few more projects to show to you guys soon. Hope y'all have a great weekend! Talk soon, friends! 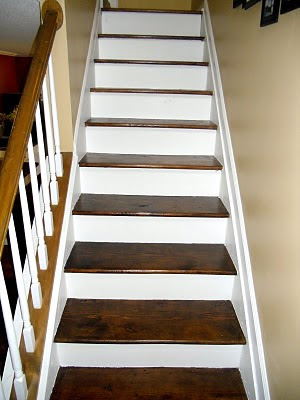 Wow the stairs look AMAZING! I want to do that to mine sooo bad! Love how you placed the pictures going up the stairs! Any tips you can pass along? I have been wanting to do same thing but can't seem to hang the first one out of fear- silly but true! The stairs look great. 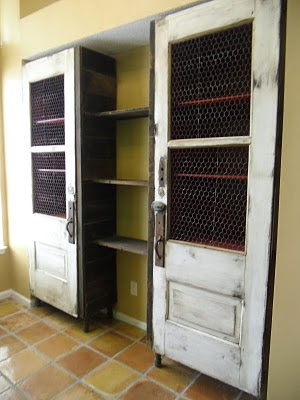 And I love the cabinet doors. 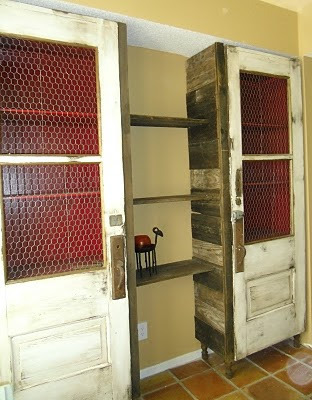 Oh my goodness...LOVE, LOVE, LOVE the doors/cabinets!!!! I am filing that one away for future reference! Just found your blog via Southern Belle Simple and "the" Twitter and so glad I did. We left the Metro Atl last June so I look forward to seeing your views of it! Happy Thursday!